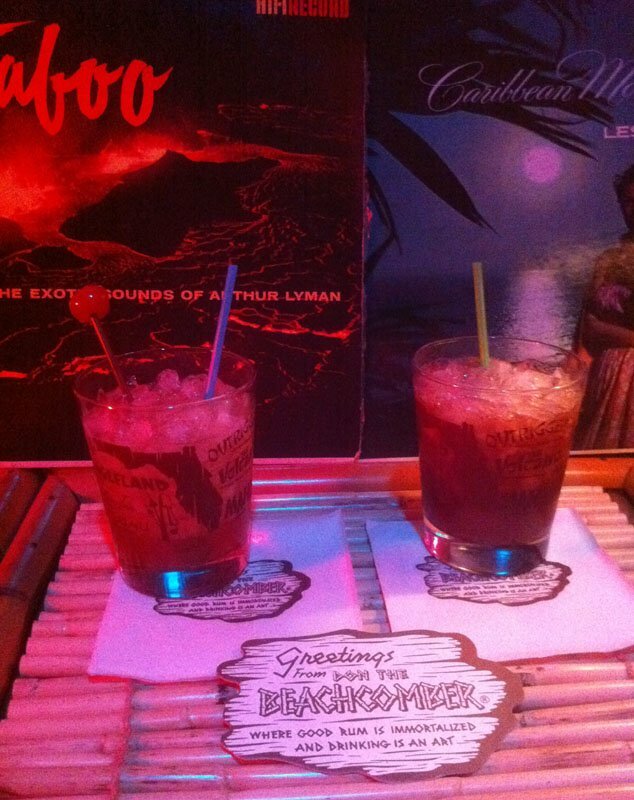 Tiki bar pioneer Don the Beachcomber’s Test Pilot was one of the most copied drinks during the mid-century heyday of Polynesian cocktails. It morphed into the Ace Pilot, Space Pilot and Astronaut, among others. 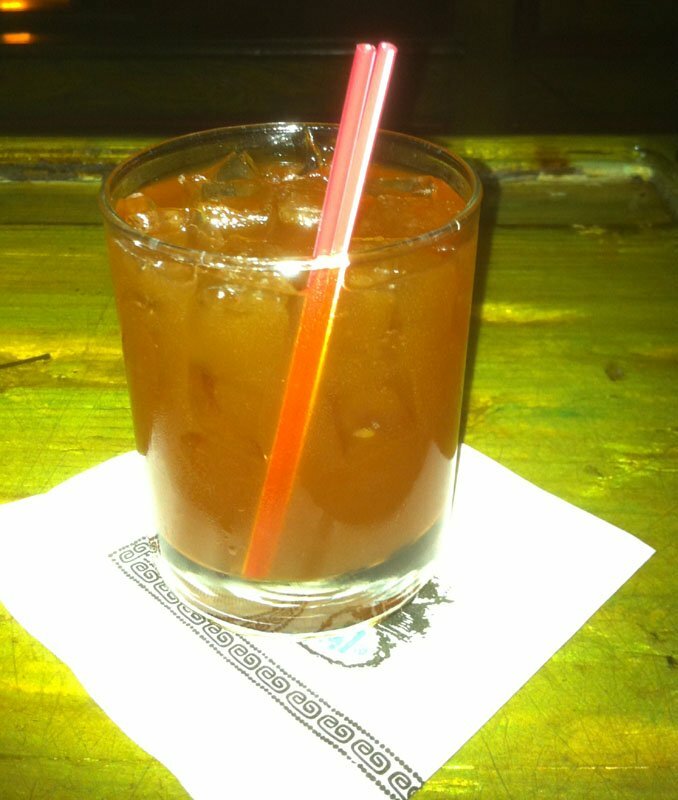 At The Mai-Kai, it became the Jet Pilot. As discussed in the review of the vintage S.O.S., Donn Beach was a decorated World War II veteran and always had a deep connection to the armed forces. In his honor, a B-26 Marauder was painted with a replica of the Don the Beachcomber driftwood sign on its nose. The plane and crew flew many successful missions in the Pacific. The Test Pilot is also an interesting study in how Donn Beach constantly tweaked his drinks. 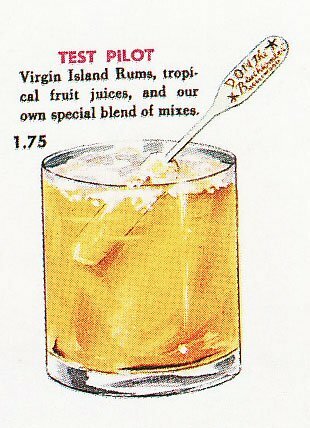 A Don the Beachcomber cocktail from the 1930s or ’40s could be vastly different than one with the same name in the 1950s or ’60s. Included below is a Test Pilot recipe unearthed by cocktail sleuth and author Jeff “Beachbum” Berry from the 1940s. It’s one of the most popular in the Tiki revival and includes many of the same ingredients as The Mai-Kai’s Jet Pilot. But I’ve also listed a later recipe from a book by Donn Beach’s widow, Phoebe. It’s slightly different but also very strong and has a similar flavor profile. Other popular versions include the Jet Pilot served at The Luau chain in the 1950s and the Space Pilot, still served today at the Tiki Ti in Los Angeles (est. 1961). 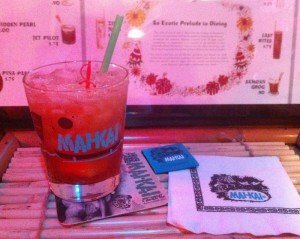 Like Tiki Ti owner Ray Buhen, The Mai-Kai’s original mixologist, Mariano Licudine, worked for Donn Beach in the early days. 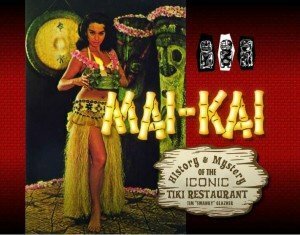 In 1956, he was lured from the Don the Beachcomber restaurant in Chicago to design The Mai-Kai’s original tropical drink menu. So it’s likely he had a vast knowledge of multiple versions of the Test Pilot when he created arguably one of the best, The Mai-Kai’s high-octane Jet Pilot. Fast and courageous, a vigorous blend of heavy bodied rums and zesty juices. Flavor profile: Dark and powerful rums, spicy and bitter notes with a hint of exotic sweetness. Review: Very complex and intense. Not for the timid. Sweet, spicy and strong all at the same time. 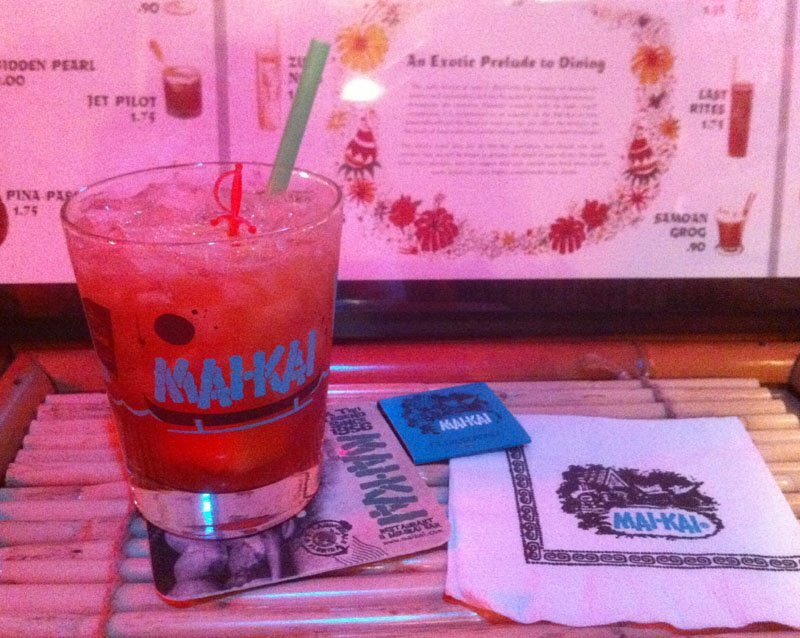 Ancestry: The Jet Pilot dates back to The Mai-Kai’s original 1956 menu and is based on Don the Beachcomber’s Test Pilot. 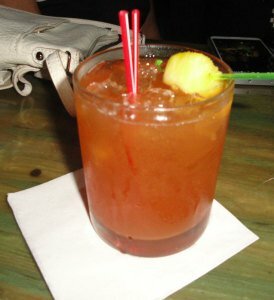 Bilge: Since the release of Beachbum Berry’s Grog Log in 1998, the Test Pilot has caught the fancy of rum and cocktail bloggers such as Blair Reynolds and Paul Clarke. Reynolds also features his version of the Jet Pilot on the menu at his acclaimed Portland Tiki bar, Hale Pele. 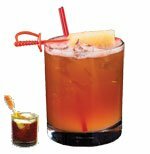 The recipe is featured in the Summer 2014 edition of Tiki Magazine & More, which also includes another recently unearthed version of the Jet Pilot from a 1960s bar guide that was revealed on Tiki Central. Blend with 1 cup (8 ounces) crushed ice for 5 seconds, then pour into a double old-fashioned glass. Add more crushed ice to fill. Garnish with a speared maraschino cherry. Cointreau and Pernod dominate this complex, strong and sour concoction that has a very old-school feel. Blend with 6 ounces cracked ice. Serve in a double old-fashioned glass. Super strong and bitter, with the rums and grape juice forming an odd but surprisingly drinkable mix. * These are quite different drinks if you look at the ingredients, but much like the story of the Q.B. Cooler and Mai Tai, somehow they yield a similar taste. * This is a very rum-forward drink so be sure to use high quality spirits. If you can’t find the elusive Lemon Hart 151, use Hamilton 151 rum from Guyana as The Mai-Kai does now. Another option is Goslings Black Seal 151, which The Mai-Kai used when 151 Demerara rum was in short supply (see below). According to Donn Beach’s biographers, he created his cocktails for specific moods, climates, and times of day. The Test Pilot was reportedly intended for afternoon sipping. By today’s standards, it’s pretty potent to while away the afternoon with. But after a few of these, it will probably make for an interesting evening. Pulse blend with 1 cup of crushed ice for no more than 5 seconds. Pour into a double old-fashioned glass, adding more ice if necessary. September 2015 update: Honey mix reduced from 1 ounce to 3/4 ounce; falernum and fassionola reduced from 1/4 ounce to 1/8 ounce (1 teaspoon); Pernod increased from 2 drops to 3. Seemingly trying to emulate Donn Beach, I can’t stop tinkering with this classic cocktail. But there are good reasons. The Mai-Kai also has been known to modify their recipe, and the latest change was noted by an alert reader (see comments below). Version 4 was indeed very sweet, and this update tampers the sweetness to yield a drier and very traditional Jet Pilot. 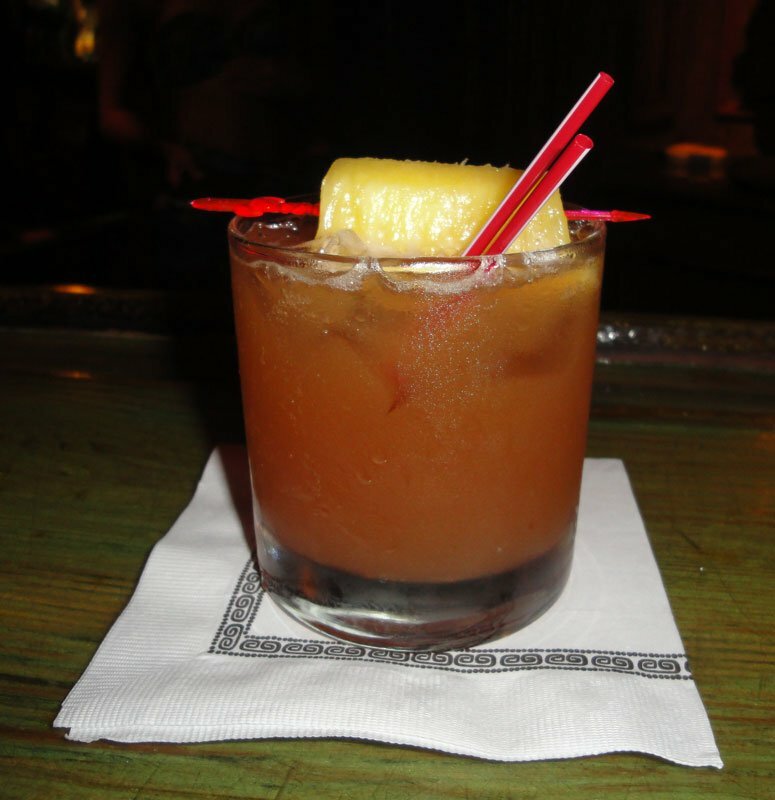 Prior to this update, The Mai-Kai made a major enhancement to this and other cocktails by introducing Hamilton 151 rum from Guyana in early 2015 (see full story), replacing Goslings Black Seal 151. Our initial review noted that the smoky Hamilton rum added complexity and depth to the Jet Pilot, cutting the sweetness significantly. But the recipe remained the same for months until we noted the reduction in honey, falernum and fassionola that resulted in a less intense yet more balanced drink. As you can tell, this recipe has gone through many changes and has evolved quite a bit over time. It all started on an old Tiki Central thread that included a very accurate recipe by Anestiki. He introduced many of the key elements of The Mai-Kai’s version, borrowing liberally from the Jet Pilot recipe in Sippin’ Safari that Beachbum Berry traces back to The Luau restaurant in Beverly Hills, circa 1958. It includes many of the same ingredients used in both Donn Beach’s versions and The Mai-Kai’s Jet Pilot. Interestingly, The Luau also had an outpost in Miami Beach, not too far from The Mai-Kai. 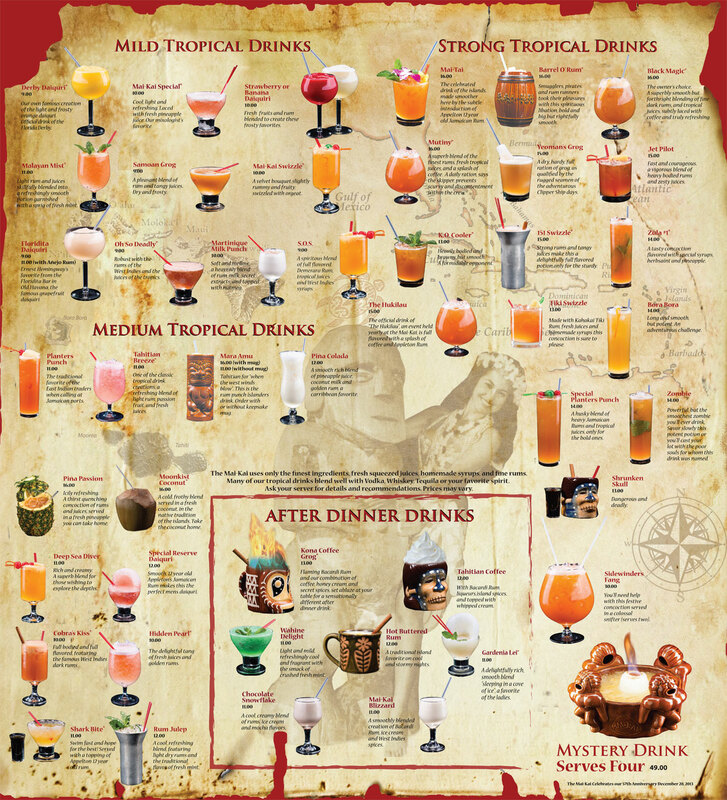 Drink names, flavors and ingredients spread like wildfire when tropical cocktails reached their peak in popularity. This explains why Donn Beach and The Mai-Kai went to great lengths to keep their recipes secret. I used this as a jumping off point for my first tribute recipe. I was quite happy with it, but it turns out I was off base on several fronts. With just two rums, it lacked the intensity of the real deal. In late April 2012, Lemon Hart 151 Demerara rum returned to The Mai-Kai after a 15-year absence and we quickly learned that it was included in the Jet Pilot. This immediately gave the drink a huge boost and version 2 of the tribute appeared on The Atomic Grog in May of that year. 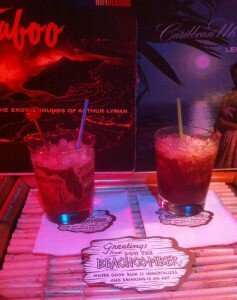 But the research continued, fueled by the interest of enthusiasts on Tiki Central and followers of this blog. One of the comments below points out the drink’s red hue and theorizes about the inclusion of the intense fassionola syrup. I also started questioning the use of cinnamon syrup after a similar revision of the 151 Swizzle recipe. 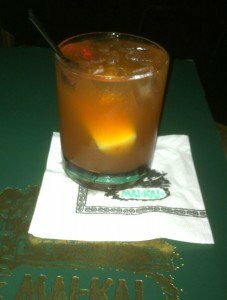 Then, the Jet Pilot’s appearance as one of the drinks in the flights served at The Atomic Grog’s Mai-Kai Mixer in June 2012 gave us a chance for further examination and revealed even more secrets. Mai-Kai manager Kern Mattei told us that the Jet Pilot actually contains four rums, and he clued us in to what they were. Also, he said, the only fresh juice contained in the drink is lime. This forced us to totally re-examine our recipe and resulted in the version 3 updates below. Without orange juice, which was in the earlier version, the drink got its hint of fruit flavor and color from the mysterious fassionola. I dropped the cinnamon syrup and, lo and behold, the combination of rums (particularly Kohala Bay) and falernum conspire to give the illusion of cinnamon. * Fassionola, discussed in depth in the Cobra’s Kiss review, is a very obscure bar syrup. It’s a rich, intense and concentrated mix that adds color along with sweet berry notes. Fassionola Red Syrup (Tropical Gold Fruit) from Jonathan English appears to be the best product on the market, and it’s often available on eBay. However, home bartenders may want to try an easy solution suggested below by Atomic Grog follower Brian Stamp. A mix of equal parts of a dark and rich grenadine (try Fee Brothers, or make your own) and Smucker’s Red Raspberry Syrup works splendidly (thanks Brian!). 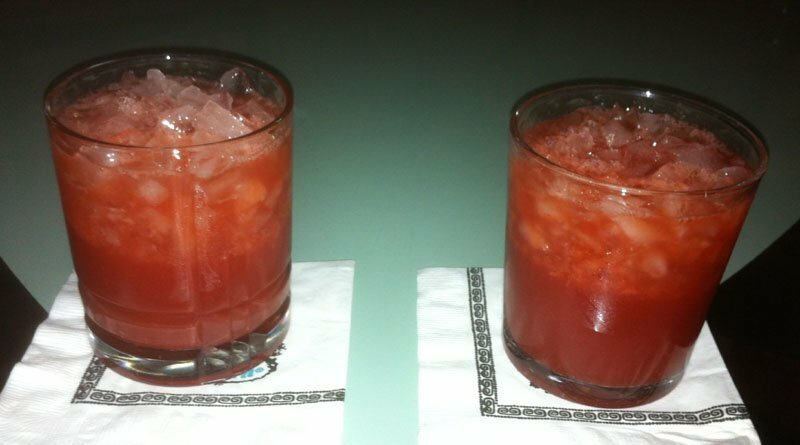 The taste and color differences between the two drinks (see photo) are barely noticeable. A more natural option to Smucker’s came to light in late 2014, when I discovered organic raspberry simple syrup from Royal Rose. 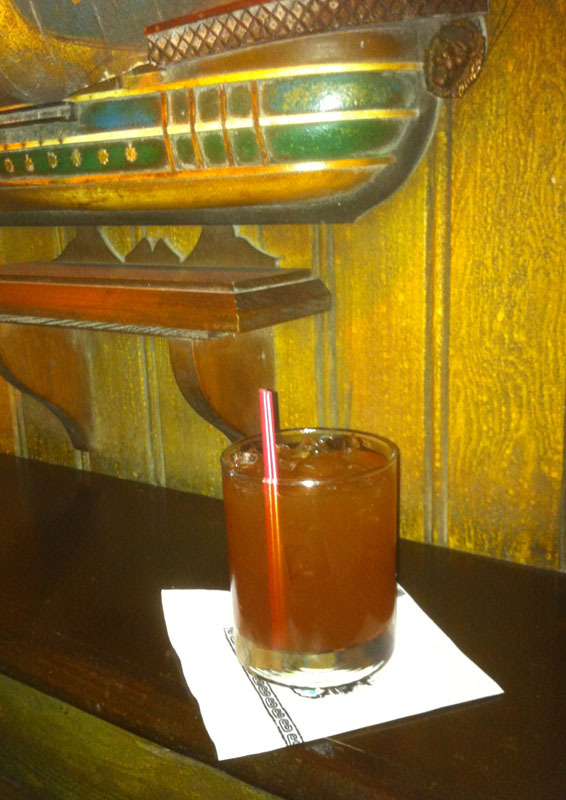 There’s also a small movement among craft bartenders to make their own fassionola (see story). * Hamilton 151 and Lemon Hart 151, both distilled by Demerara Distillers in Guyana, are equally excellent in this drink. Complementing the rich and smoky Demerara rum perfetly is the bold Kohala Bay, a London-style dark Jamaican rum that was formerly known as Dagger. 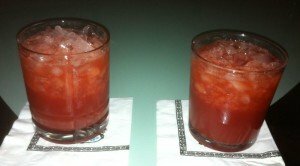 This key combination of dark 151 and dark Jamaican rums is used in several other of the top-rated strong drinks, such as the Zombie and 151 Swizzle. Kohala Bay is difficult to find in stores outside of Florida, so you may need to substite equal parts of Smith & Cross Jamaican rum and El Dorado 12-year-old Demerara rum. If you can’t find Hamilton or Lemon Hart, Goslings 151 will work, as noted above. It’s not easy to one-up the master, but Mariano Licudine and The Mai-Kai did so with the soaring Jet Pilot. On a menu full of potent potations, it’s perhaps the strongest of the strong. You have been warned. Much like the 151 Swizzle, the above recipe evolved over time. Similarly, several of the earlier versions are fine drinks in their own right so I’ve included them all below. Pulse blend for with 1 cup of crushed ice for no more than 5 seconds. Pour into a double old-fashioned glass, adding more ice if necessary. Note: When Lemon Hart 151 rum suddenly became unavailable (see story), The Mai-Kai was forced to switch to Goslings 151. While not a Demerara rum from Guyana like Lemon Hart, the blended black rum based in Bermuda does hit some of the same smoky flavor notes. And the 151 version packs the same overproof punch. While revisiting the recipe, I also noticed that The Mai-Kai’s version had a sweetness and drinkability that was missing from the tribute. But by simply cutting in half the amount of bitters and Pernod, I got a sweeter and richer Jet Pilot, very close to the version served at the time. If you perfer a little more spice, check out version 3.5 below. Note: This update brought more sweetness from the honey and fassionola to the forefront. If you prefer something a bit more potent, check out version 3 below. Note: A major update with the addition of a fourth rum, falernum and fassionola plus the removal of OJ and cinnamon. Pulse blend for with 1 cup of crushed ice for no more than 5 seconds. Pour into a double old-fashioned glass, adding more ice if necessary. Garnish with a speared pineapple finger. Note: The addition of 151 Demerara rum really makes this cocktail take flight. Some still consider this dynamic version their favorite. Note: This is a viable alternative if you don’t have dark 151 rum. This was the standard before the return of Lemon Hart. It’s also a good option if you want to turn the intensity down a notch. Which is not really in the spirit of the Jet Pilot, but you’ll thank yourself in the morning. This entry was posted in Cocktail reviews, Cocktails, Cocktails, Culture, History, History, Mai-Kai, Recipes, Rum and tagged Beachbum Berry, Don The Beachcomber, Jet Pilot, Mai-Kai, Mariano Licudine, recipe, rum, Test Pilot. Bookmark the permalink. I’ve stated this before on Tiki Central, but I think it’s interesting that the Luau’s Jet Pilot has the exact same ingredients as the ’34 Zombie from Don the Beachcomber – only the amounts of the ingredients are different. According to Beachbum Berry in “Sippin’ Safari,” Steve Crane (who owned the Luau and Kon-Tiki chain) got Donn Beach’s recipes by hiring away his bar managers. 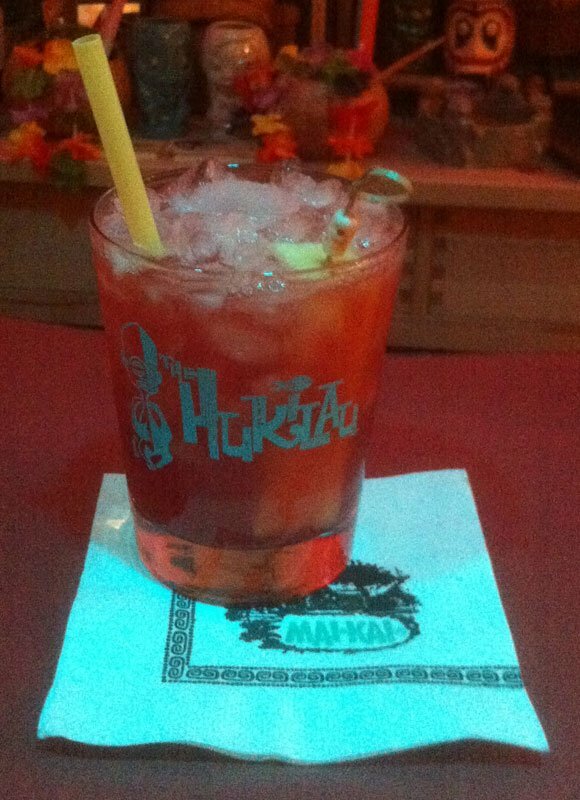 Bob and Jack Thornton had the same idea when they opened The Mai-Kai. We’re very lucky that Mariano Licudine was more creative in his re-interpretations. Thanks for the mahalo and publishing of the recipe. Let me know when you get to the Dark Magic. I have a tweaked recipe for that one too. 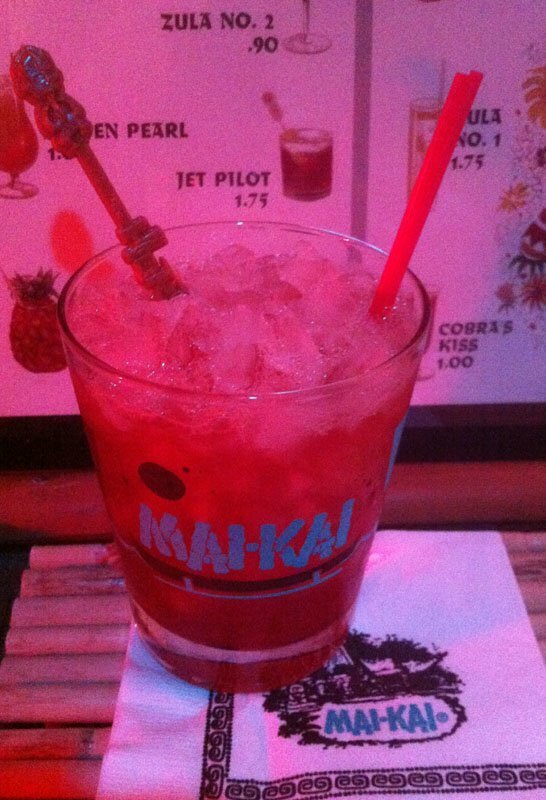 I think the Mai Kai tribute jet pilot recipe is quite close, especially as there is definitely 151 in this drink. My observation, having had many jet pilots, is that the Mai Kai version is Quite red, and sometimes quite sweet -and it seems the more red the more sweet. I suspect a version of Fassionola is included? Many of their drinks seem to have this red, sweet tinge. Ideas? Have you had the updated version with Lemon Hart 151 yet? It’s definitely for the “fast and courageous.” The Lemon Hart’s overwhelming flavor has doused the sweetness a bit, but it’s still the same red/orange color (note that the drink looks nearly identical in the two photos above). Instead of straight fassionola, I suspect that it perhaps contains what old recipes call “#7”, a combination of falernum, grenadine and a few other unknown elements (some fassionola perhaps?). We’re pretty sure the 151 Swizzle contains this mysterious syrup, and if you check out my latest photos you’ll note that it’s a very similar color. Of course, if wouldn’t be The Mai-Kai if all the mysteries were solved. I had to make a trip to Miami for work at the end of this past week, so I took full advantage of the opportunity to time my drive back north to put me at Mai Kai during happy hour yesterday. Had a Black Magic and a Jet Pilot. I had just had a non-LH 151 Jet pilot the month before at Hukilau, and the Lemon Hart 151 in the drink now makes ALL the difference in the world! If I didn’t have to get back to work today I could have drank those all night. Returned to all its former glory, this may well be my new favorite Mai Kai cocktail. Really looking forward to trying your tribute recipe — maybe tonight if I get the chance. I used the Kohala Bay rum I picked up after your “tip” to me at your Mai Kai cocktail flight. (Thanks you very much, bought 2 bottles). I made a fassionola substitute w/ my home made grenadine and Smuckers Raspberry Syrup (1/2 & 1/2) (I make the Blinker- 2 oz rye, 1 oz. grapefruit juice, 1 tsp Raspberry Syrup w/ it) . Definitely worked on the taste test. Life is good and it keeps getting better. I’m holding back on buying the Fassionola, but I know eventually I’ll have buy it and to put it up against my mix. Interesting suggestion for the fassionola substitution. We’ll have to experiment with that and see how it compares. Brian, where did you find the Kohala Bay?? Since this was on the 1956 drink menu as the Jet Pilot, I was curious as to whether it was the DtB recipe “Test Pilot” or what. The Bum’s Jet Pilot is preferred over the DtB Test Pilot and the Mai-Kai is closer to that than the Test Pilot, but The Bum says that is a Steven Crane recipe. Your tribute is closer to the later DtB recipe and the Luau version. I am inclined to think the Luau and Mai-Kai versions are takes on the later DtB version, which was a pre-56 version. The Mai-Kai renamed the drink the Jet Pilot and just happened to coincide with the Luau name, but not the same recipe. I confirm the honey as it was allowed to slip by a Mai-Kai insider. Ok…first of all i want to say the Mai Kai is one of my favorite places in the world. However they have changed the recipe of the Jet Pilot and I’m not sure it was for the better. I had one tonight and realized something was changed. I was able to confirm that they no longer use falernum. Our Molokai Maiden also stated that the recipe had changed recently with Mr. levy’s approval. I think the v2 recipe is the best version of the Jet Pilot..even better than the one currently served at the Mai Kai. Oh btw… I sometimes add just enough fassionola to give it a slight red color. Tonga, we’ve confirmed that the Jet Pilot was tweaked slightly and probably no longer features falernum (as of late July). Also, the fassionola was probably reduced. But we’re holding off on posting these changes above until some time goes by and we’re sure that it will remain this way. We already have more than enough variations of the Jet Pilot, but I suppose one more won’t hurt. Has anyone had the Hamilton Jamaican Black alongside Kohala Bay rum? I have had Kohala Bay at Mai Kai only in a cocktail. I’m wondering if the Hamilton Black could be used as a substitute? I’ve tried the Hamilton Black and it’s got way too much of that pot-stilled funkiness to be substituted for Kohala Bay. It’s more comparable to a darker Smith & Cross, whereas Kohala Bay is closer to something like Corbua, with a little extra heat and funkiness. It’s a nice rum though. Just noticed that version 3 of Jet Pilot has a typo (14 oz of dark 151 rum). I’m assuming it’s 1/4? or is it 3/4 oz? Good catch! That should be 1 ounce.